I ADORE autumn and winter clothing and spend more on clothes in October and November than I do in all of the spring/summer months put together. Pastels and summer dresses just don't do it for me. I love leopard print, leather, lace, glitter and tartan and you get all these things in abundance on the high street at this time of year. I normally rush out and buy loads of party dresses and impractical things like a faux fur coat which end up matted and damp in the winter rain so this year I'm planning ahead. What do I actually need? Some warm clothing, sensible shoes and something glamorous for a night out or Christmas party. I've come up with a few looks that will last me throughout the winter and chosen the key items to complete them. I know I'm a dress girl through and through but I have to admit I've been on the lookout for a pair of skinny jeans that I can get over my behind for the past few weeks. I've been buying nothing buy t-shirts all summer (mainly geeky ones on teefury) and I'm a little bored of pairing them with a skater skirt so the hunt for the perfect pair of jeans is on. 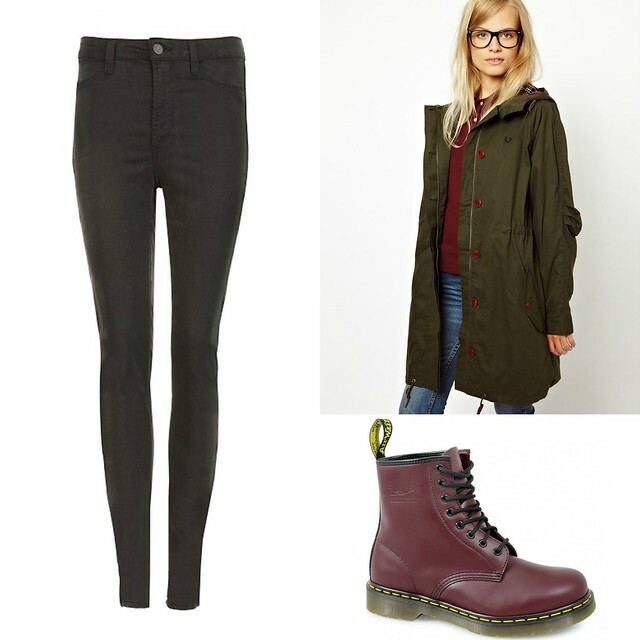 The Fred Perry parka has been on my wishlist for a while now, I'm just waiting for some discount codes because not only does Fred Perry come with a lot of heritage it also comes with a hefty price tag.The Dr Martens are a classic but also hard wearing and great for jumping in puddles, perfect A/W shoes. This is definitely going to be a go-to look for me on weekends. Biker jacket and a tartan skirt paired with one of my many band t-shirts and some on trend cut out boots will be functional and fairly sassy. I've been looking for a new green lace dress since I had to sell my beloved Dotty P one after losing weight and I think I've found the perfect one. This ASOS number is the perfect price and I know it will get plenty of wear over the festive period. Paired with some classy strappy heels and a classy clutch I think this will be my trusty outfit for a night out. Have you splurged on A/W clothes or are you a student holding out for a store lock in and 20% off? Ooh I really like that parka. You can tell there's a touch of quality in the design of it. I want a utility jacket and classy ankle strap heel too!